On Thursday, April 7, Michael J. 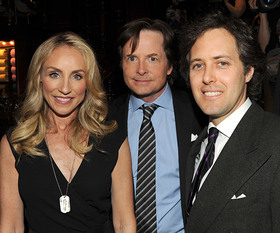 Fox and his wife, Tracy Pollan, hosted an evening of cocktails and charitable shopping at the Ralph Lauren Men’s store at 867 Madison Avenue to benefit The Michael J. Fox Foundation for Parkinson’s Research. In honor of Parkinson’s Awareness month in April, Polo Ralph Lauren has partnered with The Michael J. Fox Foundation to create The Limited-Edition Michael J. Fox Foundation Dog Tag designed to raise awareness for the fight against Parkinson’s disease. Michael J. 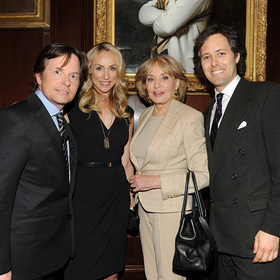 Fox, Tracy Pollan, Barbara Walters, and David Lauren. The Limited-Edition Dog Tags were available for purchase at the MJFF celebration, which saw guests such as Barbara Walters and Tom Selleck roll up to show their support. Polo Ralph Lauren will donate 100% percent of the net proceeds from sales of all the Dog Tags to benefit the MJFF. The Limited-Edition Dog Tags will also be available at select Ralph Lauren stores, RalphLauren.com and Rugby.com through out the month of April. The Michael J. Fox Foundation is dedicated to finding a cure for Parkinson’s disease through an aggressively funded research agenda and to ensuring the development of improved therapies for those living with Parkinson’s today. 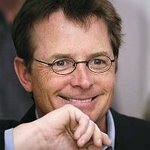 Operating at the hub of worldwide Parkinson’s research, the Foundation forges groundbreaking collaborations with industry leaders, academic scientists and government research funders; increases Parkinson’s awareness through high-profile advocacy, events and outreach; and coordinates the grassroots involvement of thousands of Team Fox members.